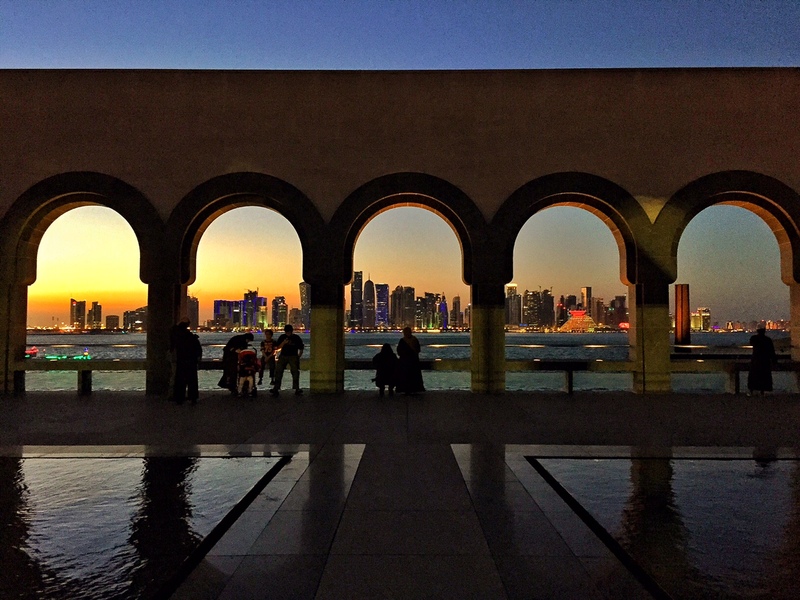 Doha captures your heart, mind and soul with its deep routed culture and modern infrastructure. It is the capital city of Qatar which is a small country located in the Middle East. The country will be holding the 2022 FIFA World Cup and Doha is undergoing an evolution towards an extravagant modern city. However unlike neighbouring tourist hub Dubai, Doha has managed to maintain a strong sense of self. The Waqif Souq is filled with incredible sights, smells and sounds, the extravagant hotels will give you a glimpse of how the upper class live and the Museum of Islamic Art will leave you speechless with its stunning and intricate ancient artefacts. The most common way for people to enter Qatar is through the Hamad International Airport in Doha. Direct flights are available from many locations and a quick stop in Dubai will connect it to many others. The airport serves multiple airlines including Qatar Airways, Emirates, Etihad, Pegasus Airlines and Turkish Airlines. 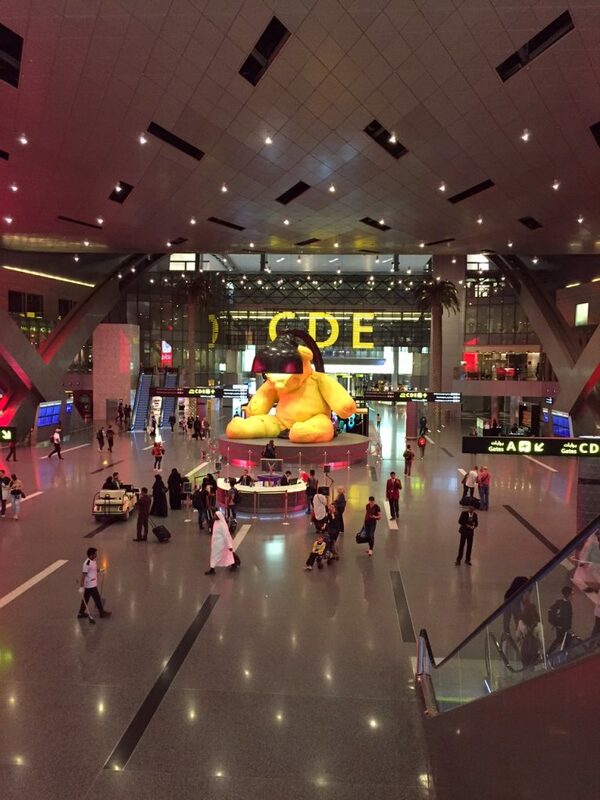 The new Hamad International Airport in Doha is considered one of the best airports in the world. Uber is by far the quickest, easiest and most cost effective way to get around Doha. Rides are cheap and the door to door service will be a relief once the heat of the day becomes too much. Taxis are available for those rare times where there is no wifi for Uber and they are not too much more expensive. Try to be aware of roughly where you should be going as the drivers can occasionally be over confident with directions and you may not end up at your desired location on the first attempt. Buses are available but are not particularly plentiful or on schedule. However if you have patience they can be a great option to save a little money. To take the bus you need a prepaid card which can be bought at grocery stores or major bus stations. Walking is only recommended for short distances. There is a city-wide problem of missing footpaths and Doha’s extreme heat can lead to dehydration, so always carry water and if you feel dizzy or overheated find somewhere shaded to sit and rehydrate. Also due to the city’s current evolution for the 2022 World Cup there are lots of construction sites so be careful walking around these. If all else fails you can take a dhow across the bay! The expectations for dress are somewhat more conservative in the Middle East and Qatar is no exception. The standards here are a little more restrictive than nearby Dubai but they are more relaxed than neighboring Saudi Arabia. Tourists should avoid showing shoulders and knees and to show their respect for the culture they should ideally wear long sleeves, long pants or a long dress, with no cleavage or midriff showing. A head scarf is not required except for mosques and religious sites. 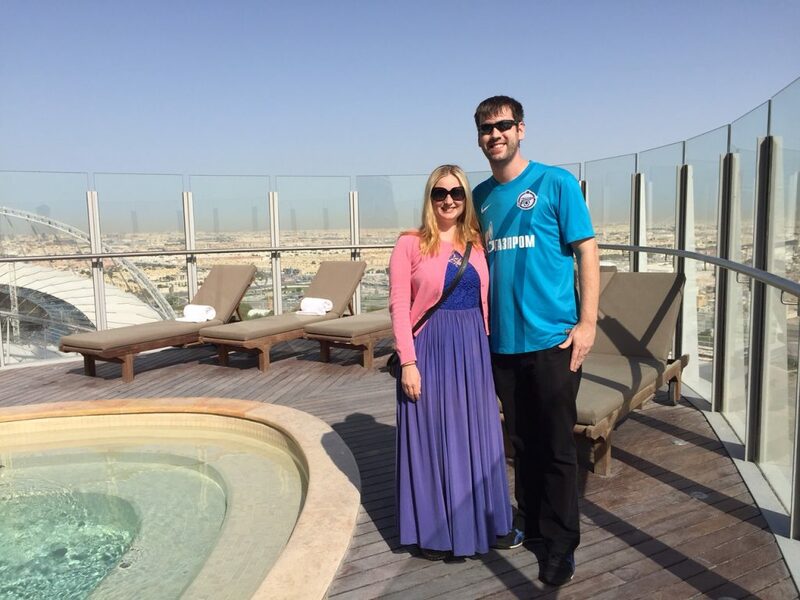 The dress requirements can sometimes feel restrictive in hot and sunny Doha but it is important to show your respect and abide by the local culture. A 4 Star hotel at a reasonable price. 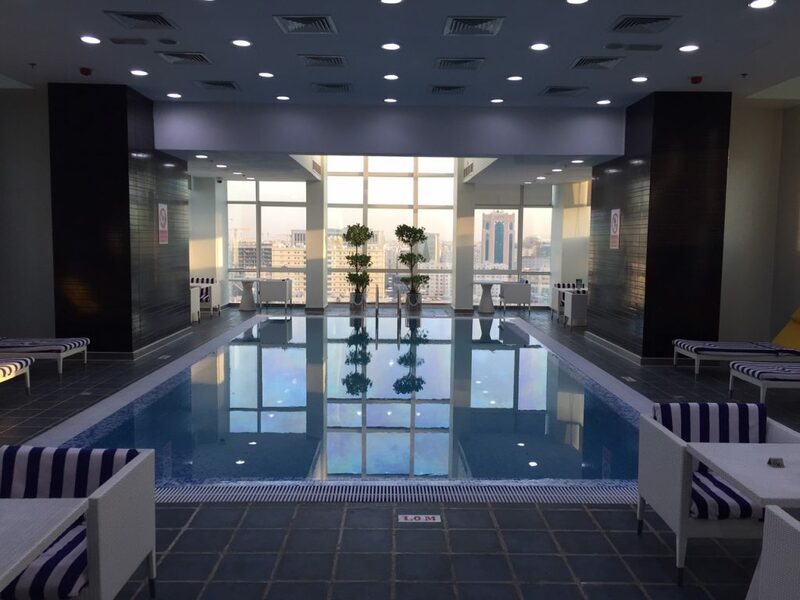 They have smoking and non-smoking rooms, a gym and an indoor roof top pool. The rooms are a decent size with comfortable beds and most important of all, the air conditioning is excellent! 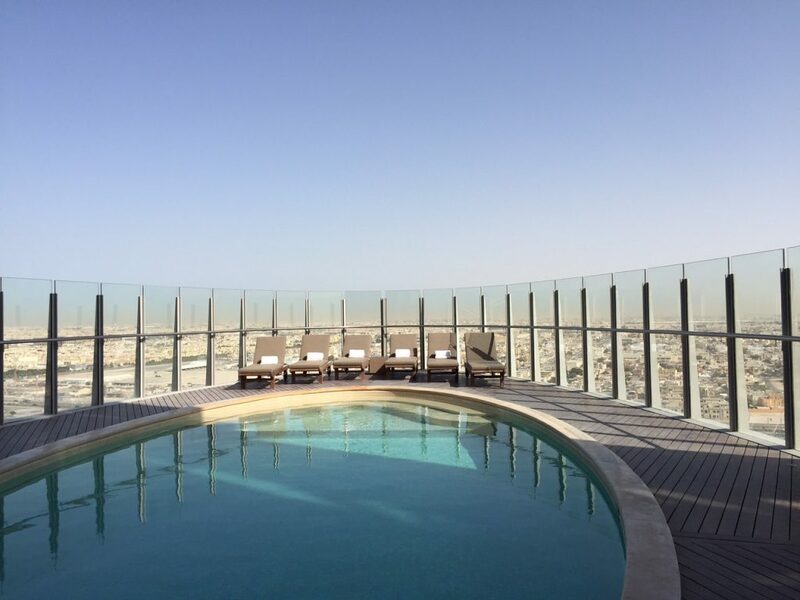 It is walking distance to the Waqif Souq and Museum of Islamic Arts. Search availability and book the Ramada Encore on Booking.com here. Take a dip in this pool with a view! The Sheraton is a 5 Star hotel on the waterfront. It is an opulent hotel with excellent service. 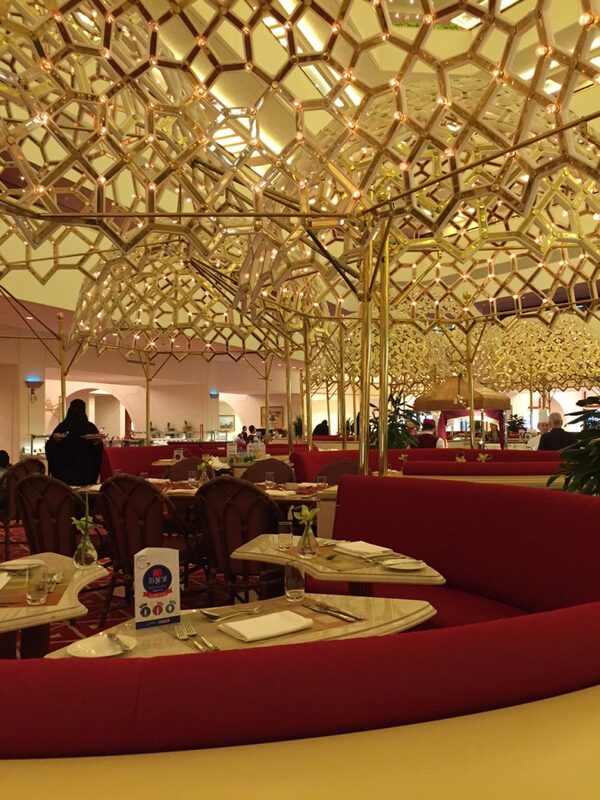 There are several restaurants and the lobby is beautiful with extravagant furnishings. While not a budget hotel the rooms are not overly pricey. It is walking distance to the Doha City Center Mall which has a cinema, ice rink, restaurants and a number of stores. Search availability and book the Sheraton Doha on Booking.com here. The extravagant furnishings in the Sheraton Hotel will have you not wanting to leave! The Torch is a new exquisite hotel located on the West side of Doha near the Villagio Shopping Mall and the Khalifa Stadium. It is 51 stories high and has a pool at floor 19 with amazing views of the city and stadium. The Flying Carpet restaurant will capture your imagination and have you feeling like you are a character in Aladdin. While this hotel is beautiful with great service be aware that it is 20 minutes away from most of Doha’s attractions. Search availability and book The Torch Doha on Booking.com here. The pool on Level 19 of The Torch hotel has an impressive view. There is a real fusion of flavours in Doha. Influences come from a mix of middle eastern nations and further away to Europe and Asia. Think flat breads, hummus, Turkish ice cream, pad thai, zaatar and kebabs. Shisha may not be a food but the pipes are very common at restaurants and markets in Doha so they go hand in hand. Try the flavoured tobacco and live like a local. 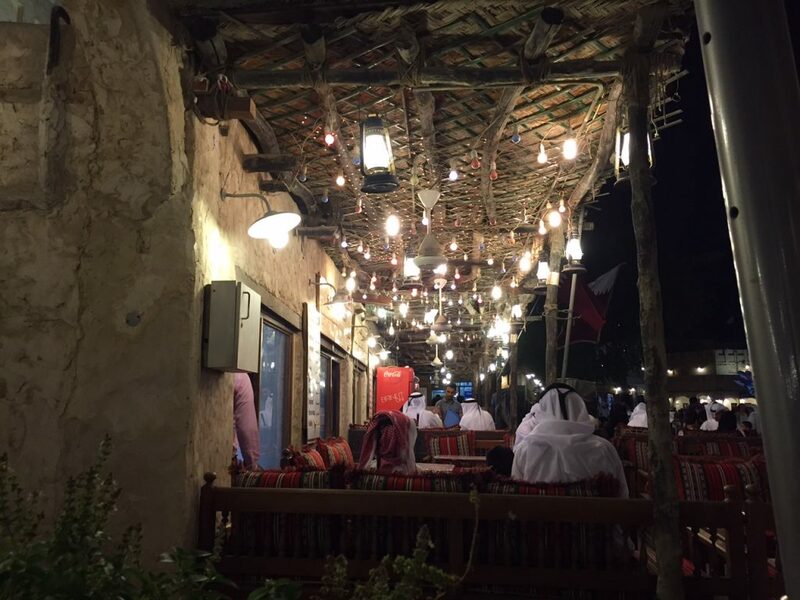 Eat where the locals eat and go for street food or a restaurant in the Waqif Souq. 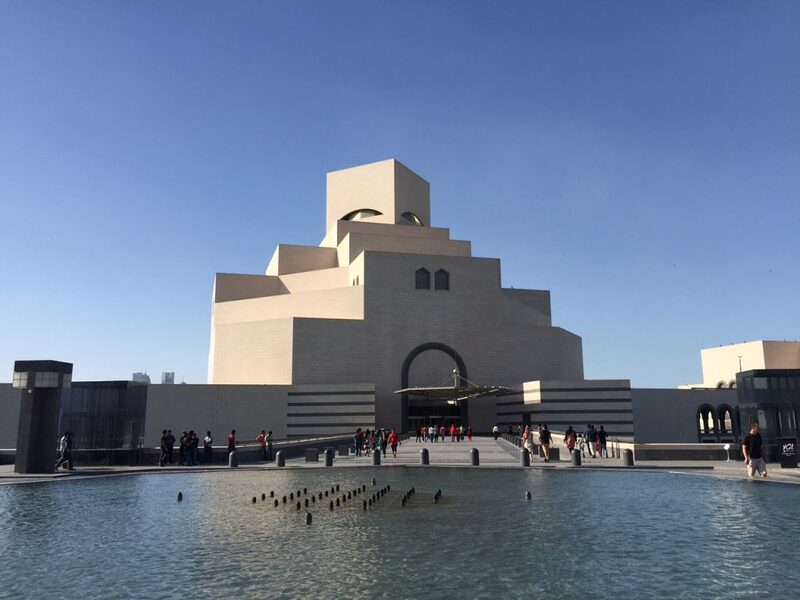 This spectacular museum is located on the waterfront of downtown Doha and even the building itself is a work of art with a palm fringed road leading up to the entrance. The museum has 4 levels filled with artefacts from across the Middle East, some of which have been dated to over 1000 years old. Think jewel encrusted daggers, colourful carpets and delicate glass lamps. The rich culture leaves an impression on you long after you have left the building. Entry is free and entrance times change day to day so check online before planning your trip. Before you leave make sure to walk outside towards the library to see the beautiful arches that frame the city skyscrapers. This statue is located near the Museum of Islamic Arts and is worth walking to for a quick look. 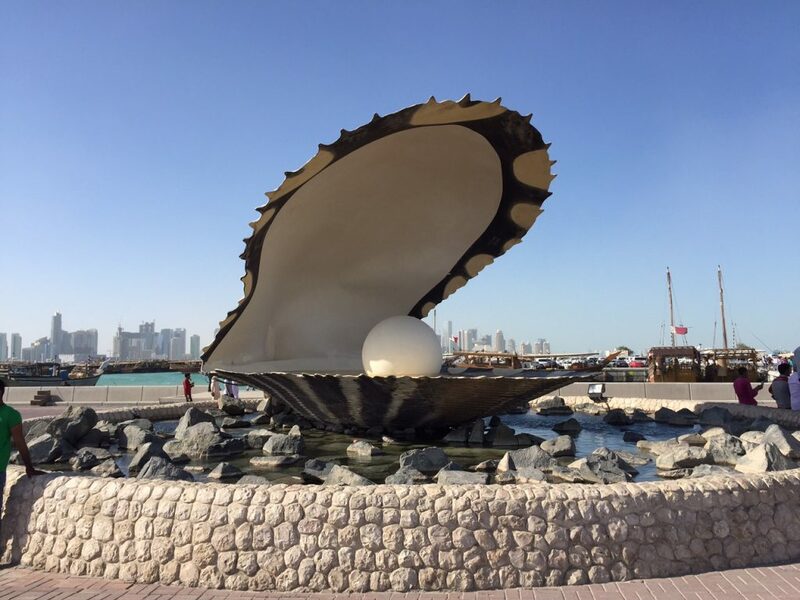 It was built in recognition of the local pearling industry that was prevalent before pearl seeding became commonplace. The pearling industry was once a major industry in Doha Qatar. 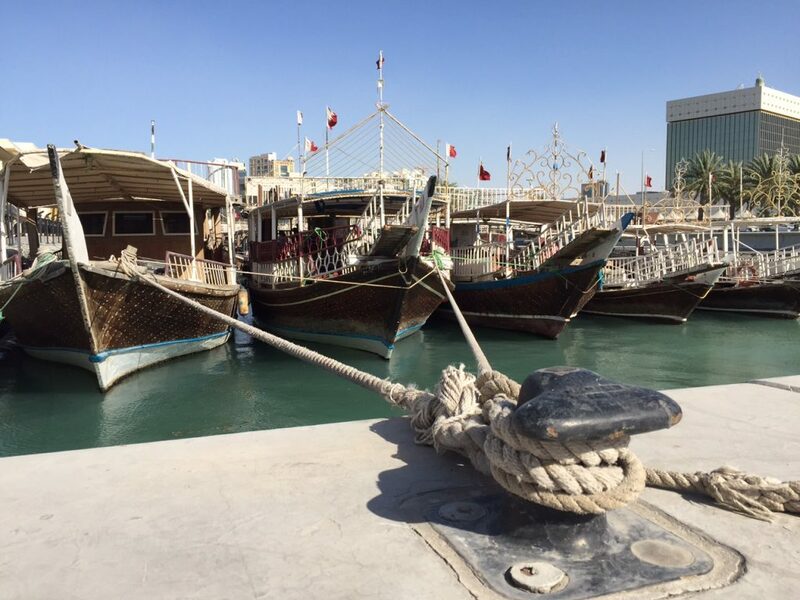 The waterfront is the perfect viewing location to see the skyscrapers of Doha and the many traditional dhow boats by the shore. The area becomes very lively on a Friday night as the boats become discos! 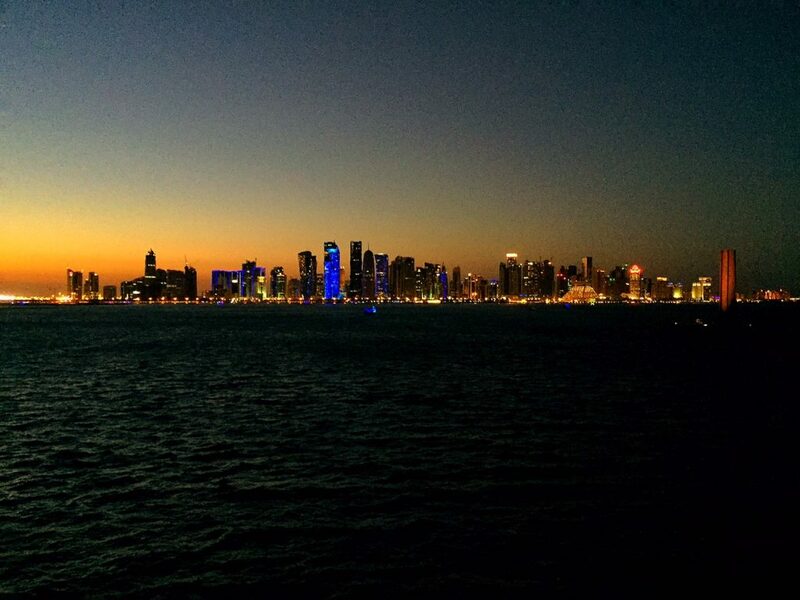 The lights of the Doha city skyline become an impressive night as the sun goes down. The Waqif Souq is located in downtown Doha and can be reached by foot from the Museum of Islamic Arts. It features endless alleyways filled with aromatic spices, colourful fabrics and exotic flavours. The smell of shisha wafts through the air. 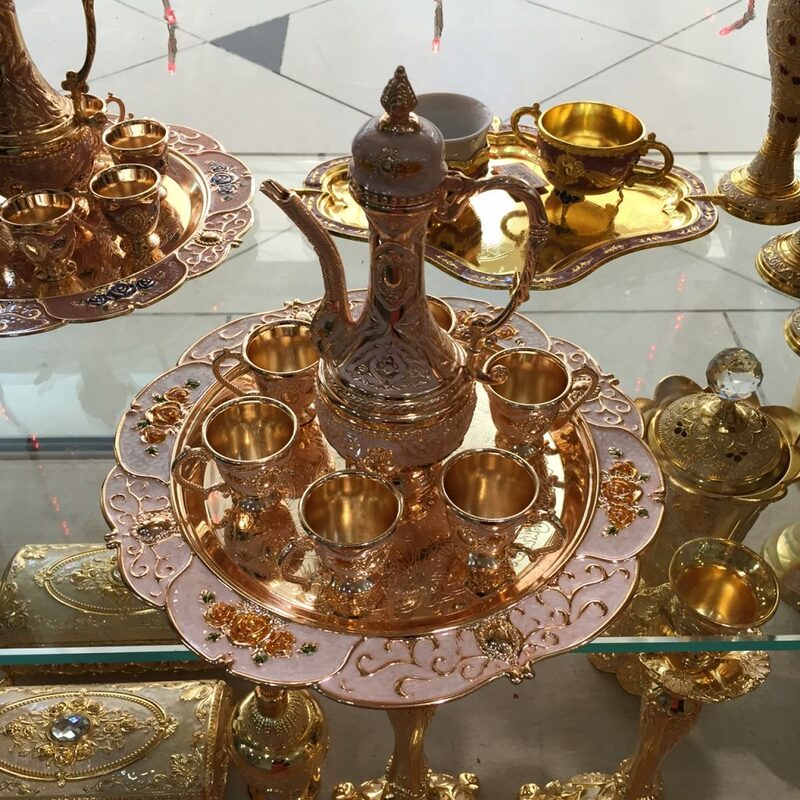 There are numerous restaurants with many types of Middle Eastern cuisine and you can buy all types of souvenirs including jewel encrusted camels and golden lamps that one might dream could contain a genie! Make sure to find the Gold Souq hidden deep in the alleys which features gold sellers with long chains of gold and exquisite gems on display. 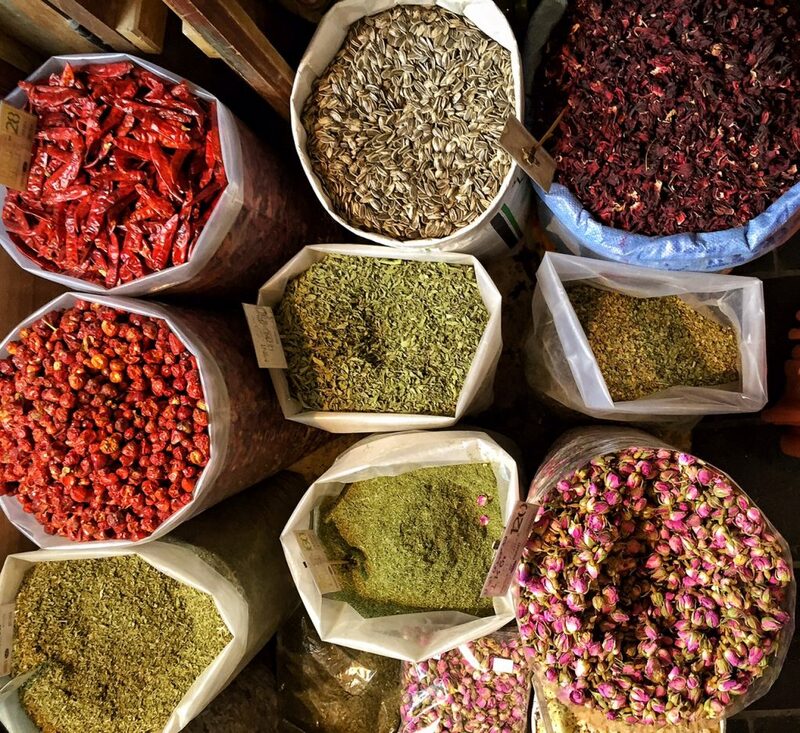 The smell of the spices in the Waqif Souq is mesmerising! For thousands of years people in the Middle East, Asia and Europe have used falcons to hunt. In more recent times, as technology has evolved, the practice of falconry has near disappeared from most of the world. But Qatar is one of the few places where it still exists and it is heavily ingrained in the culture. 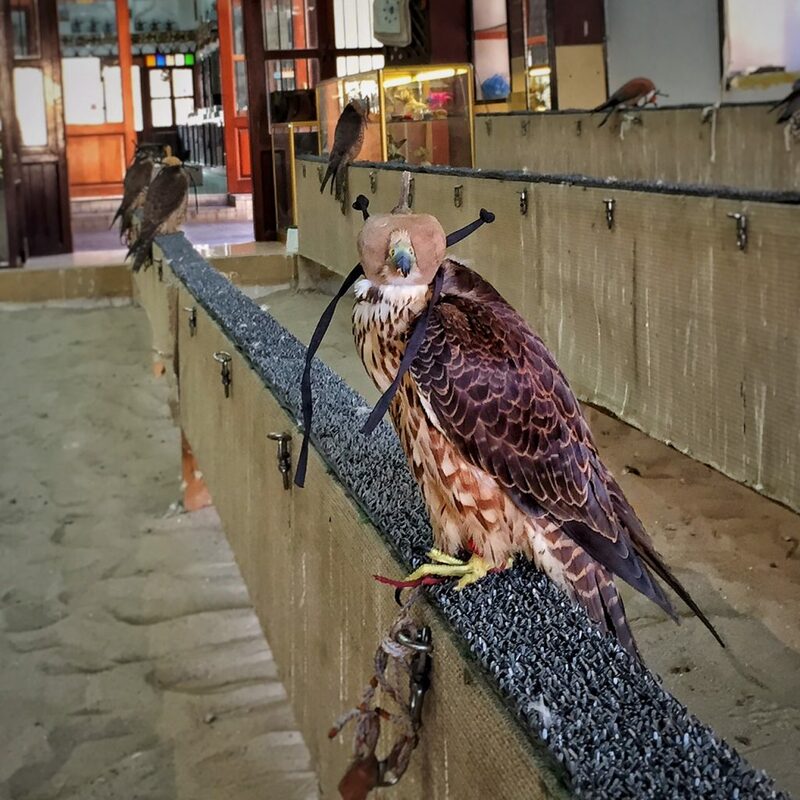 Trained falcons can be found for sale in the Falcon Souq in downtown Doha which is located on the far West side of the Waqif Souq. These prized birds cost thousands of dollars are treated with reasonable care. There is even a falcon hospital on site. Sellers are used to tourists visiting their shops and they are keen to discuss the practice of falconry with anyone who shows their interest. This shopping centre is located near many of the major hotels on the north side of the Corniche. It contains several interesting stores where you can buy intricate tea sets or colourful lamps as well as other goods. There is an ice rink on the bottom floor which can be great to cool off after a long day in the sun. A cinema and several restaurants are located upstairs including a Chinese buffet and American style burger chains. The Pearl Qatar is similar to The Palm Dubai in that it is an artificial island. It is also a magnet for the rich so if you like expensive and flashy cars get yourself a seat at the Costa Coffee and watch as Maseratis and Ferraris drive past. At the wharf you can see some of the biggest private yachts in existence with gulf buggies zipping around driving those who are wealthy enough to live here around. It is the perfect place to people watch. The Venetian architecture will make you forget you are in the Middle East. 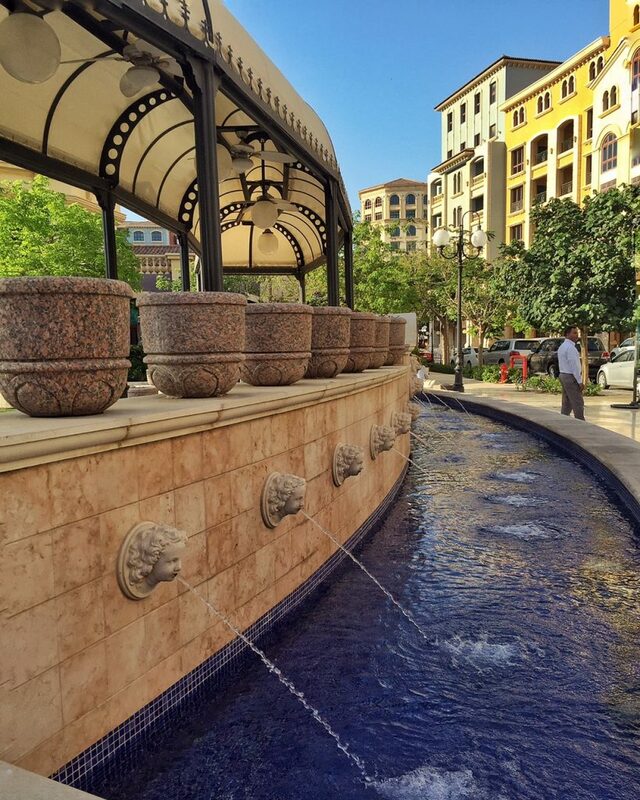 The Villagio Shopping Mall is designed around a Venetian theme and is reminiscent of the Venetian Hotel in Las Vegas. 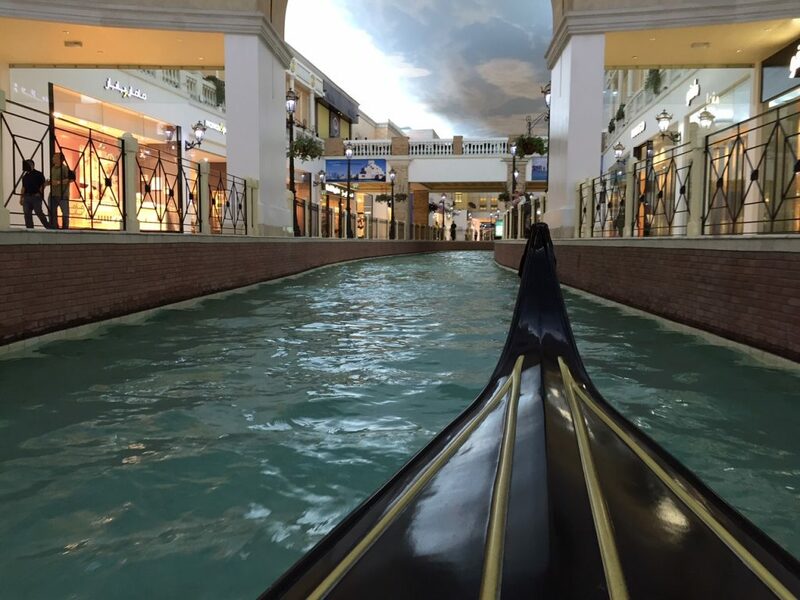 There is a canal through the centre of the mall and you can go for a gondola ride for 10 Riyals. There is also an ice skating rink and a number of high end shops and restaurants. 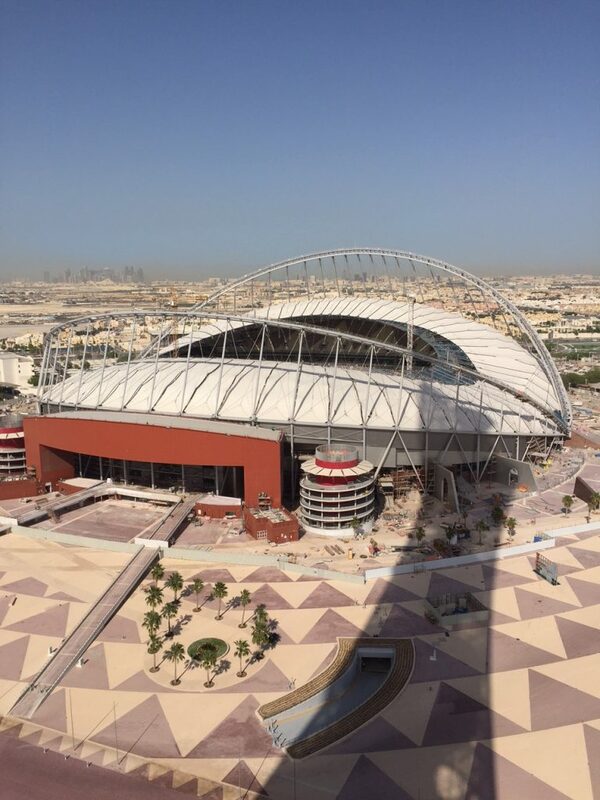 The Khalifa Stadium is located next to the Villagio Mall. The impressive stadium is still under construction for the 2022 FIFA World Cup so you cant go inside but it is a sight to be seen. For the best view go to The Torch Hotel nearby and ask to go to the Pool Level on Floor 19. This stadium will become the centre of the world during the FIFA World Cup in 2022.